Migrations of the Holy: God, State, and the Political Meaning of the Church by William T. Cavanaugh. Whether one thinks that "religion" continues to fade or has made a comeback in the contemporary world, there is a common notion that "religion" went away somewhere, at least in the West. But William Cavanaugh argues that religious fervor never left -- it has only migrated toward a new object of worship. In Migrations of the Holy he examines the disconcerting modern transfer of sacred devotion from the church to the nation-state. 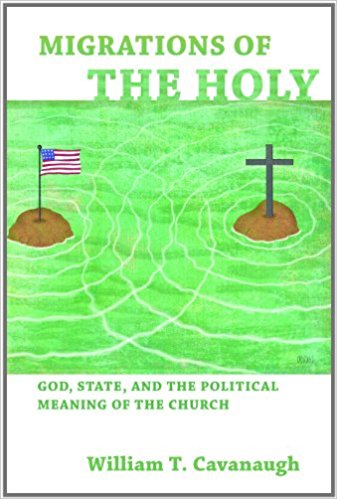 In these chapters Cavanaugh cautions readers to be wary of a rigid separation of religion and politics that boxes in the church and sends citizens instead to the state for hope, comfort, and salvation as they navigate the risks and pains of mortal life. When nationality becomes the primary source of identity and belonging, he warns, the state becomes the god and idol of its own religion, the language of nationalism becomes a liturgy, and devotees willingly sacrifice their lives to serve and defend their country. Cavanaugh urges Christians to resist this form of idolatry, to unthink the inevitability of the nation-state and its dreary party politics, to embrace radical forms of political pluralism that privilege local communities -- and to cling to an incarnational theology that weaves itself seamlessly and tangibly into all aspects of daily life and culture. Read more about the book in a blog post by Cavanaugh on EerdWord.